Question for Wing Chun students. What if they just have a nuclear weapon tucked in their waistband. Or what happens to a boxer if the other person has surgically implanted metal all over their skeleton like wolverine. Well yeah. 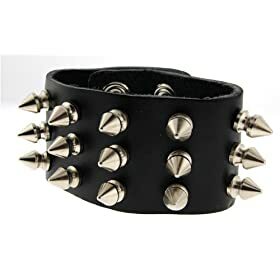 One of my friends got chased away by a gang of punk rock (Whatever they are) guys...They ALL had spiked jewlerry they were using as a weapon. Could you beat them or not? Pass a law and make them illegal. I give the troll 1/10. I've have been seeking to have children made illegal for some time, but just haven't been able to get the ball rolling. Actually in China, the Government limits families to one child. Not sure if it's true but I recently read it somewhere. OpenYourEyes, it really doesn't matter what they wear. A real Wing Chun person is not there to "show" them their Tan Sau, or to Bong/Lop them. The only purpose is to attack them. The only time we would have a wrist to wrist defensive situation is only if there was some sort of obstruction of my attack. Otherwise you just hit. And if for any reason I ever came in contact with one of those wristbands, I would not care at that moment. I would choose to do whatever I needed to (F them up), and get out of there and worry about it later. agree, just do whatever you were taught in class, and if you still cant beat them, you wont be able to even if they didnt wear the wristband. I know everyone has ridiculed teh guy for posting this question, but it is a valid point. I know a lot of people who wear these kind of things. When people say spiky jewellry,they migt not necessarily mean actual spikes, but sharp material. One student I trained with struggled because I was sweating and he kept slipping off! A good chunner wouldn't have a problem though. You can grab anywhere on the forearm. But you should never train to use one style of attack or defence. That is why I learn to box and kick! But I also don't usually grab, just hit!! Very nice point. That is why Wing Chun has other aspects apart from trapping skills. I am new to this forum and willing to give the poster the benifit of the doubt. If the assailant was in any form of a front stance I would aim a bil sao at their eyes as a distraction while delivering a short, sharp low front kick, upward and outward to the inside of the patalla of the lead knee. If they are in a neutral stance then it would be, bil sao + low round to the inside of one knee then (from chum kui) rebound into a low side kick to the inside of the other knee. Still with the same foot circle slightly downard and to the centre and deliver the coup de grace with a front kick to the groin. Spike on the wrist shold not come in to play. If any contact to the upper limbs is required it would probably be more with the forearms and elbows. If locks are used (chin nah) contact would more likely be with the hands and not the wrists. Personally I would just kick the guy into submission anyway!!! No MARTIAL ARTS are said to be the BEST..
Do u mean "spikes" as in glass..guess u a Muay Thai boxer..? as i know some MT guys do train with it..In that case i seriously will considerate bout learning "Matrix" Kungfu being able to slow-mo bullets and everything else including "spikes on wrist..